I don't know about you, but I definitely make a few minor adjustments to my morning skincare and makeup routine in the summertime. For everyday I definitely like a very simple makeup look because I hate the feeling of a lot of makeup when it's super hot outside. Below is my everyday regimen for clear and glowing skin in the summer. Mario Badescu Enzyme Cleansing Gel- I've talked about this cleanser on here before quite a few times (read about it here and; here!) and for a good reason, it is seriously the best cleanser I have ever used and works wonders for my skin. This gentle cleanser never dries out my combination skin and uses natural Alpha Hydroxy Acids to chemically exfoliate skin and breakdown anything that might be clogging your pores. I use this all year round. Mario Badescu Cucumber Cleansing Lotion- As the temperatures have continued to rise in July I switched to this cooling toner which helps me to control oil and shine throughout the day. It not only works to combat the shine and oil, but it also disinfects and further removes any residue that may clog pores, helping to keep skin clear. Aveeno Active Naturals Smart Essentials Daily Nourishing Moisturizer- This is another product I've talked about a lot on here because it is a standby for me. I love that it is packed with antioxidants, Vitamins A, C, and E, that work to fight free radicals your skin comes into contact with. It also has an SPF of 30, which is a must have for me in the summer. Garnier Skin Renew Miracle Perfector BB Cream- I use this in the Light/Medium shade, but since my skin is so fair I mix it with my Aveeno Moisturizer to lighten it up a bit. This does a great job at evening out my skin tone and I also love that it brightens my complexion and gives it a hint of color. Benefit Cosmetics Stay Don't Stray- Not to sound dramatic, but this undereye concealer primer completely changed my life. I apply 3 dots under each eye before my concealer and blend with a brush, this keeps my concealer looking great all day and completely crease free. Benefit Cosmetics Boi-ing Concealer- This concealer is great for covering up undereye bags and circles and any other little little imperfections on your face. I recommend using it with a concealer brush to blend everything for a natural look. Laura Mercier Invisible Loose Setting Powder- I am completely obsessed with this 'magic' powder, I apply it under my eyes after the Boi-ing concealer and it works to set it and brightens up my undereye area. CoverGirl Clear Mascara- I've been using this inexpensive mascara for years to tame unruly eyebrows. You can pick it up at almost any drugstore and I comb it through my brows every morning to ensure they look and stay nice and neat. CoverGirl LashBlast Fusion Volume and Length Mascara- Another favorite of mine is this mascara, which I have talked about on here before. I have tried seemingly a million mascaras, but lately have been using this exclusively because I love it so much. The large brush makes it so easy to coat all of my lashes and the formula adds volume and length, but never flakes. I also have really sensitive eyes that get itchy easily from mascara and this never bothers them. Benefit Cosmetics Coralista- Since my skin is so fair blush is a must have for me to add a little color to my face. I sweep this coral pink blush on my cheekbones, it warms up my complexion and adds a subtle hint of sparkle. 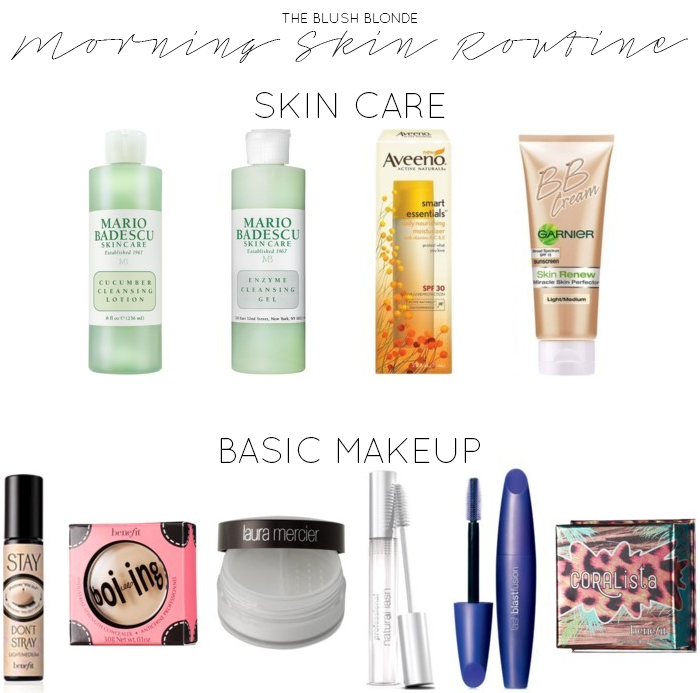 What are your favorite products when you get ready in the morning? Does your routine change depending on the season? I love reading about makeup/skin care products. Can't wait to try some of your faves girl!!! I need to tray the mascara base, the white one. I heard about it a lot and all good things so it's time to give a try! I use and love a lot of Benefit products. I use Boi-ing Concealer along with Erase Paste every day. I really need to try the Stay Don't Stray. Oh I would love to try the Stay Don't Stray - it sounds perfect for what I need. I've been searching for a good mascara. I loved a primer I had a sample for, but I'd love an all in one - maybe I'll try this!